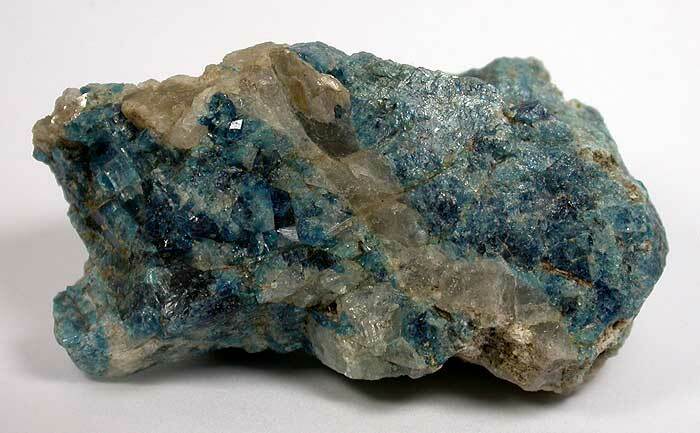 Origin Last Hope Claim, Mwami (Miami), Karoi District (Urungwe; Hurungwe District), Mashonaland West, Zimbabwe. 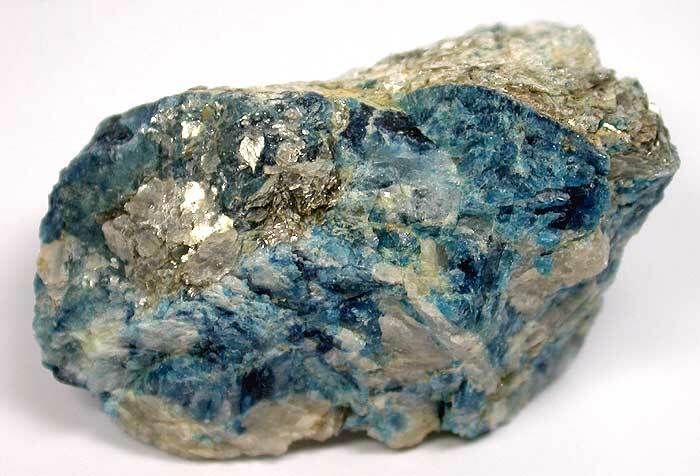 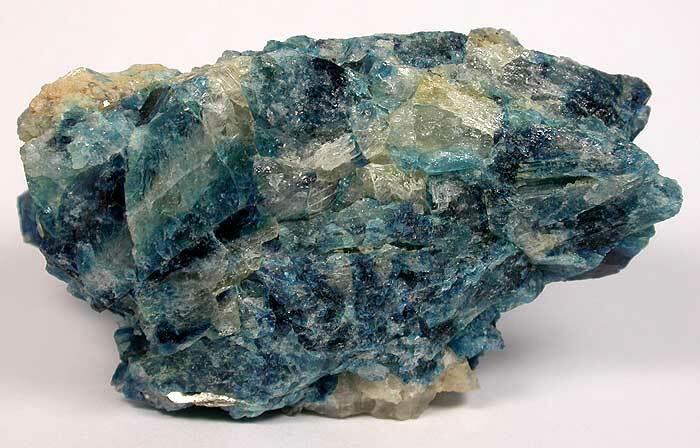 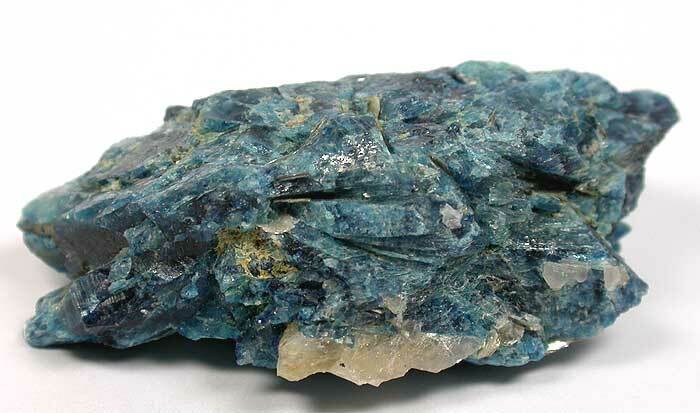 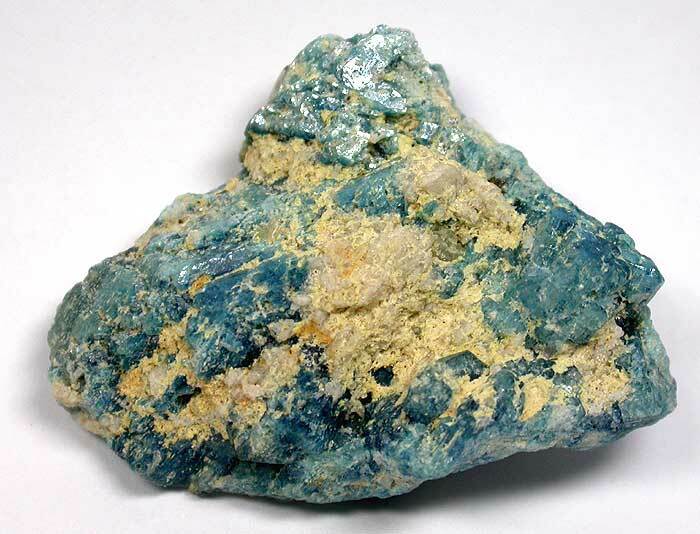 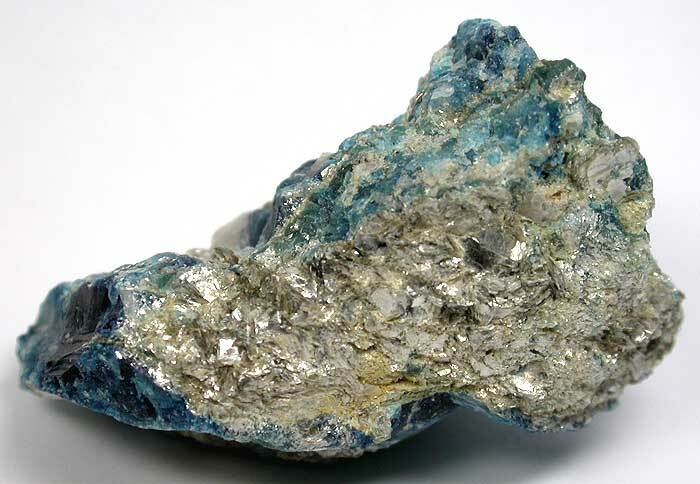 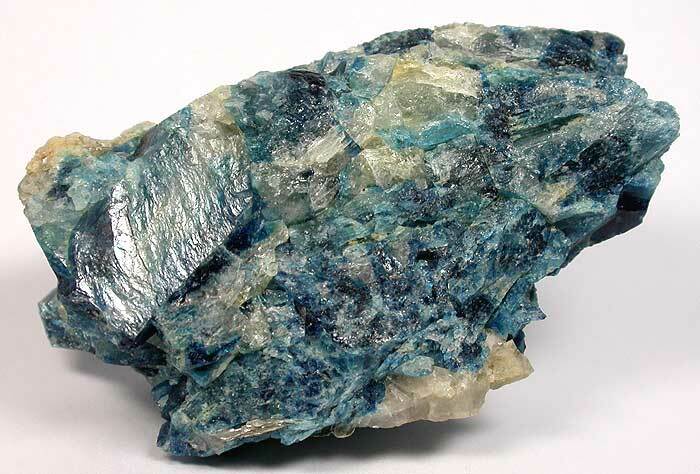 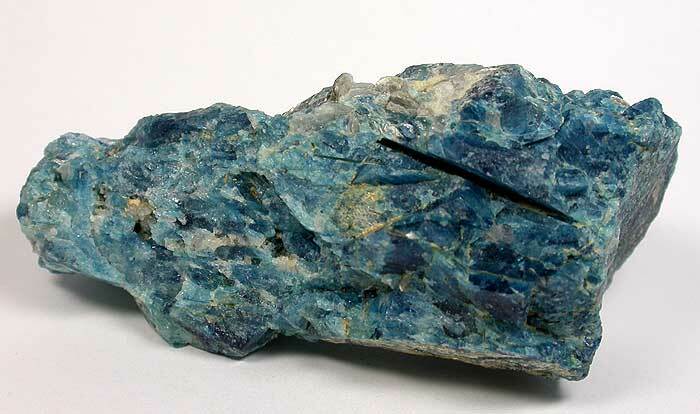 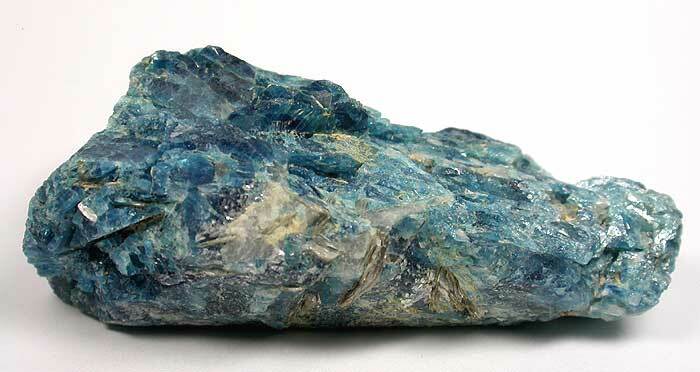 Description Rich electric blue mass of Euclase in association with a little Muscovite associated. 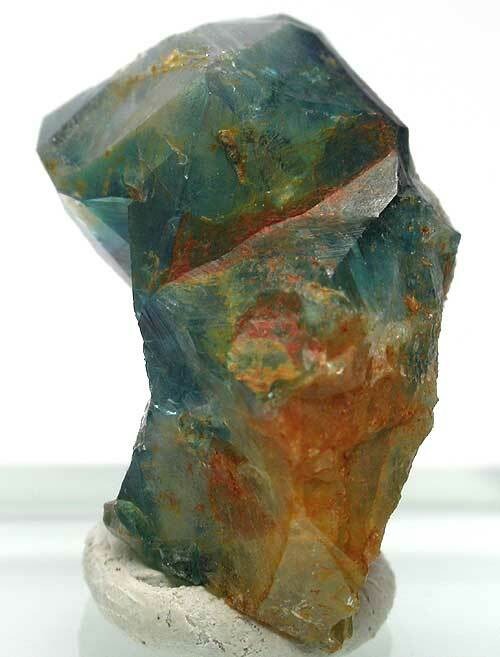 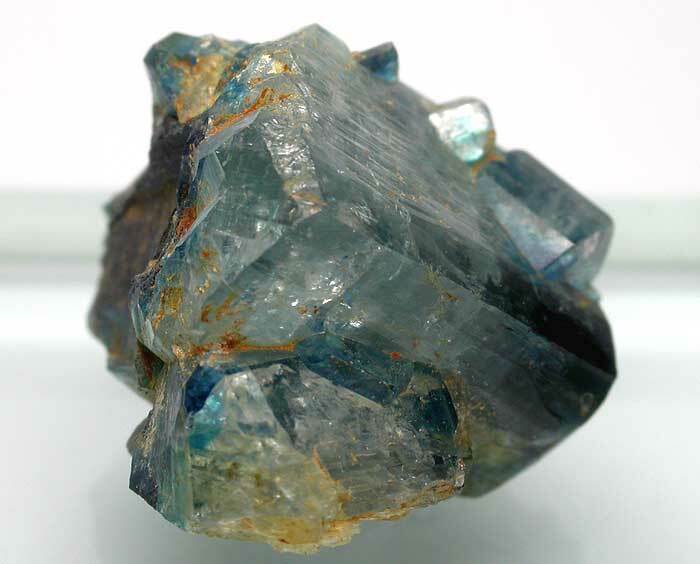 Partial pseudomorph of Beryl crystal, showing a rough hexagonal outline if viewed from one end - a rare example. 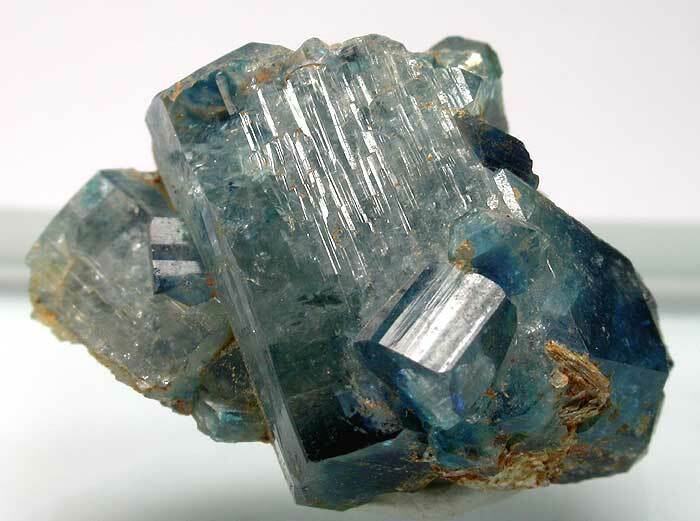 Description Mass of rich Light and darker blue Euclase crystal sections and cleavages intersected by a greyish Quartz vein with a little muscovite in association. 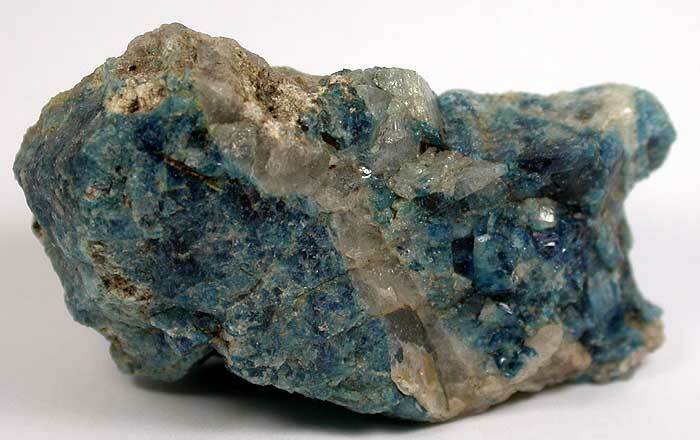 Description A shallow near trangular shaped specimen of Blue Euclase showing some crytsal faces upon which is scattered some cream colored Feldspar. 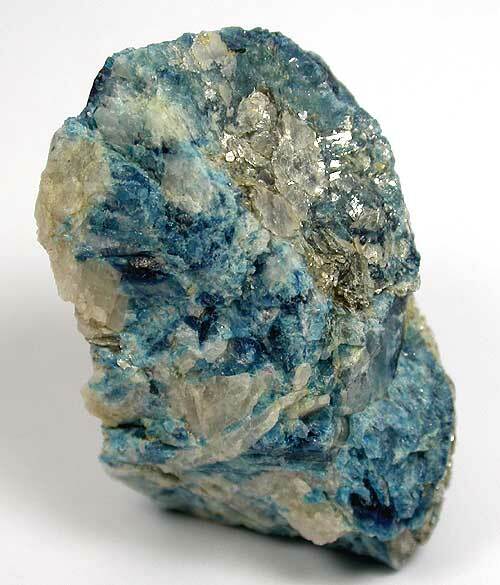 A thin layer of Muscovite mica coates the bottom of the specimen. 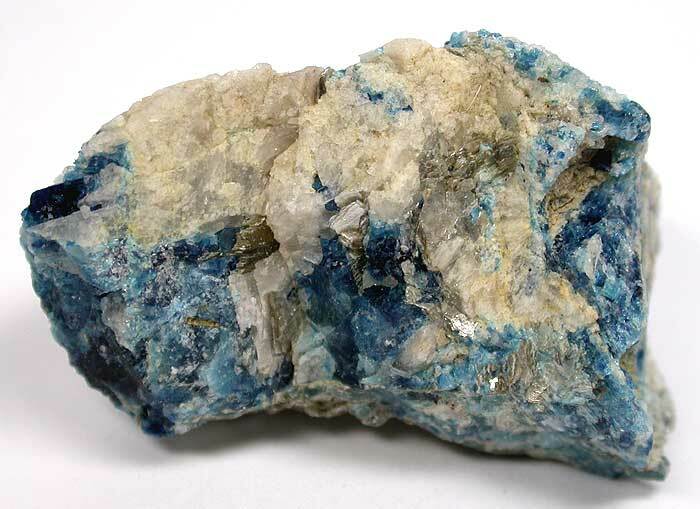 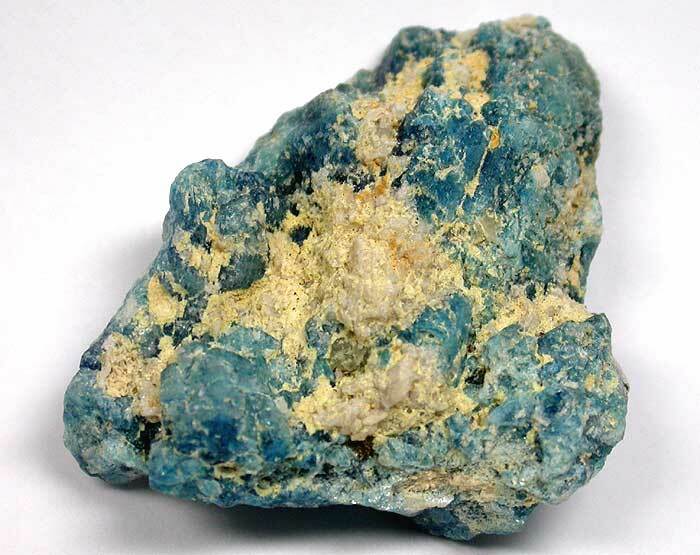 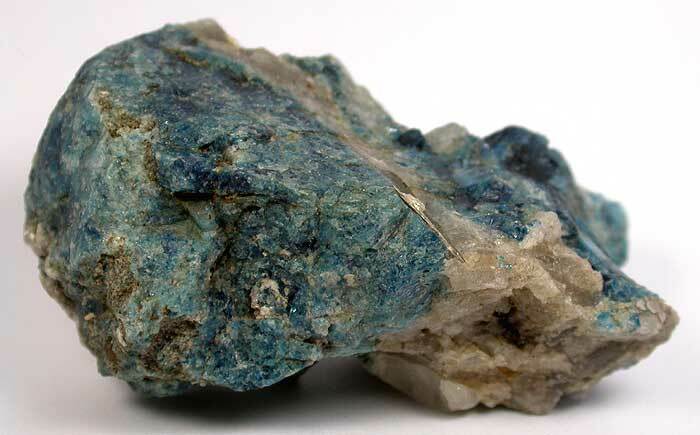 Description Granular, deep and paler blue cleavages and crystal sections are intergrown with Quartz and Feldspar with silvery Muscovite in association. 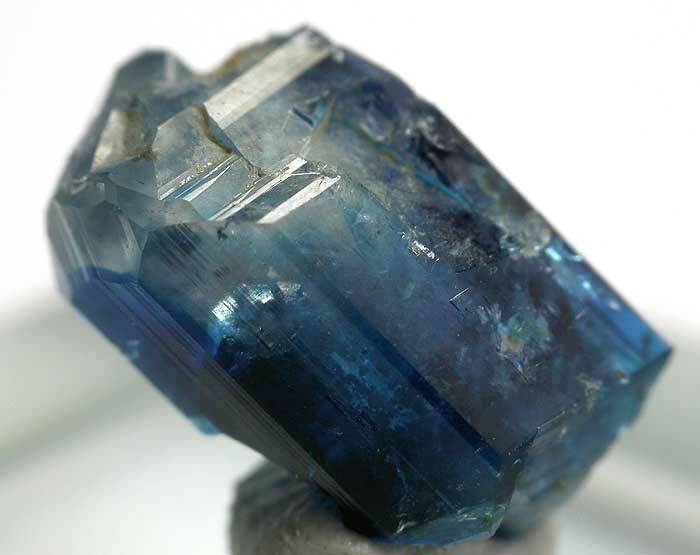 Description Rich deep electric blue intergrown cleavages and crystal section make up this fine example of Euclase from the well known Zimbabwe locality. 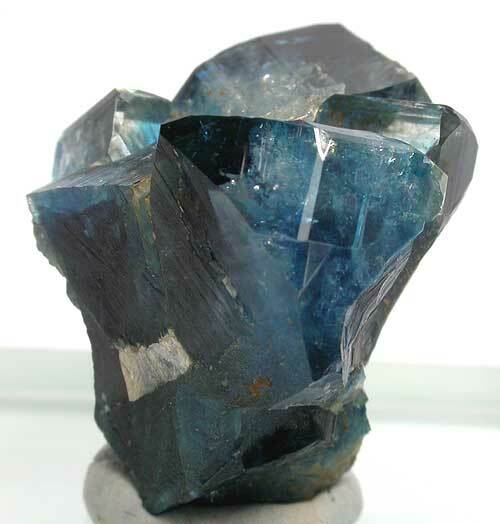 A little Quartz is associated. 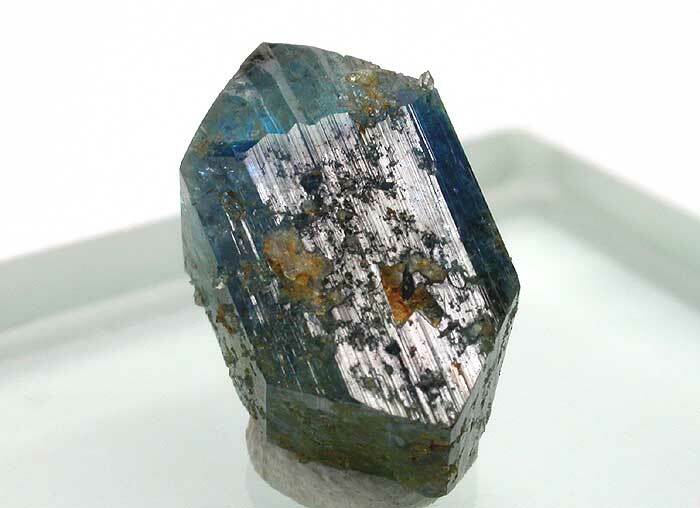 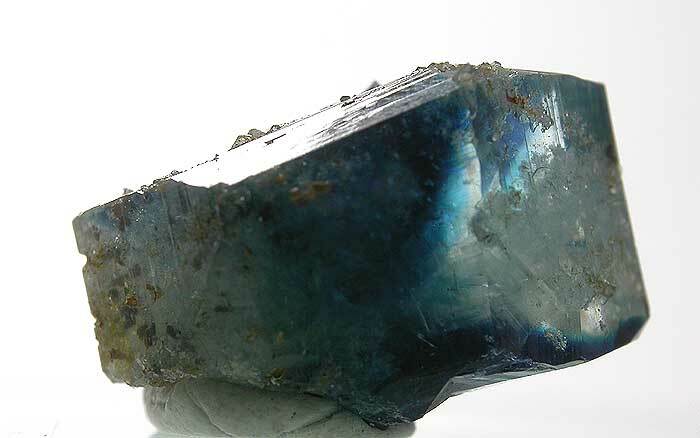 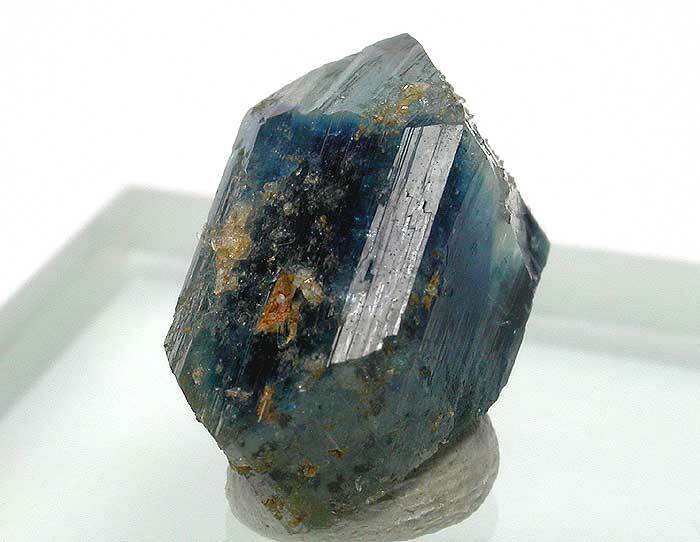 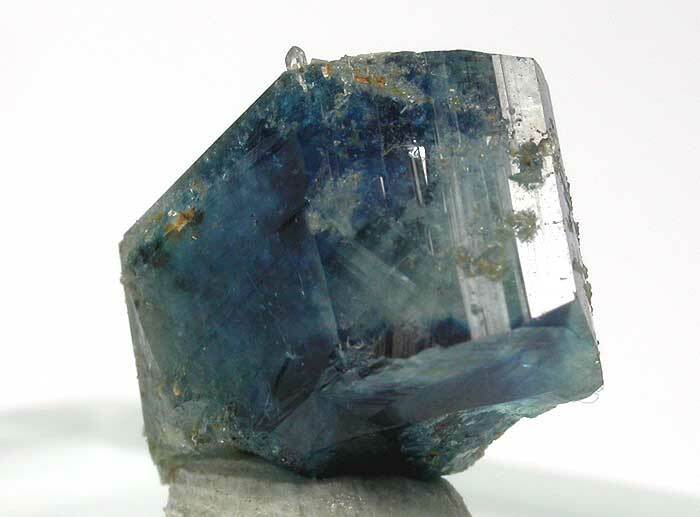 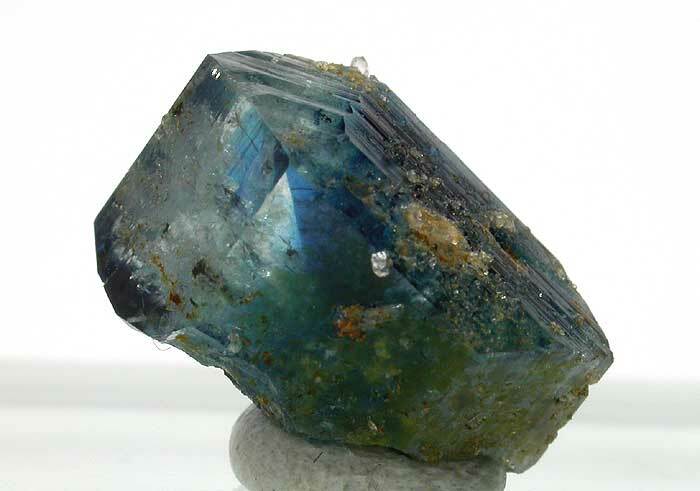 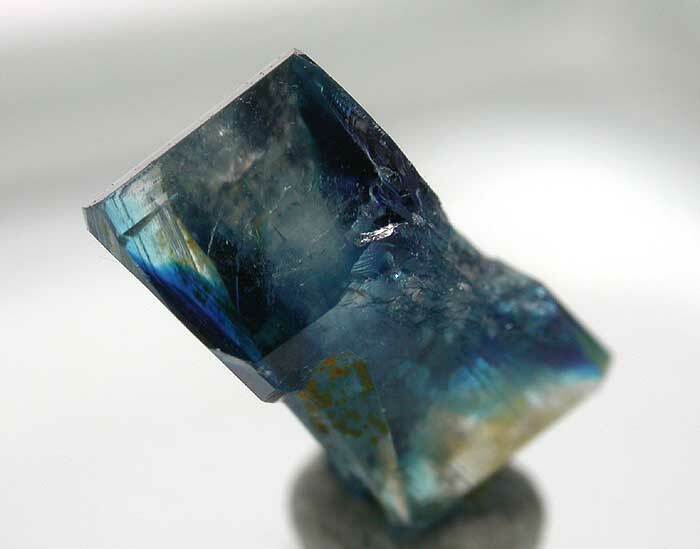 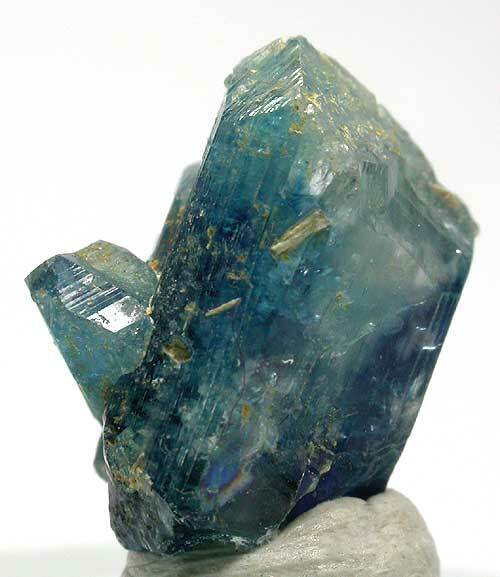 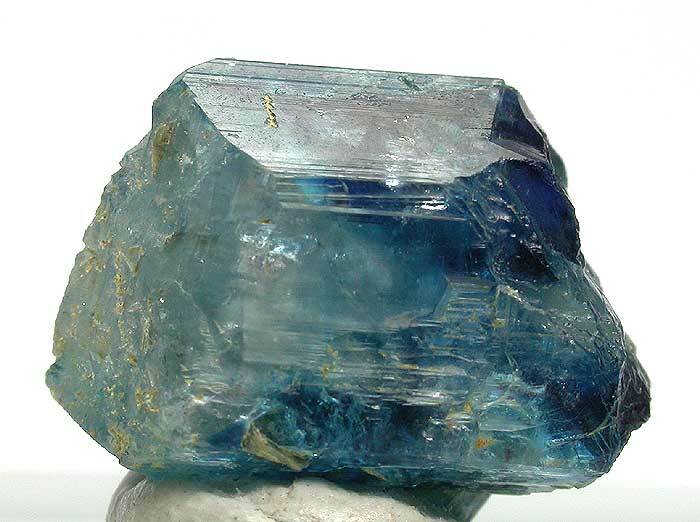 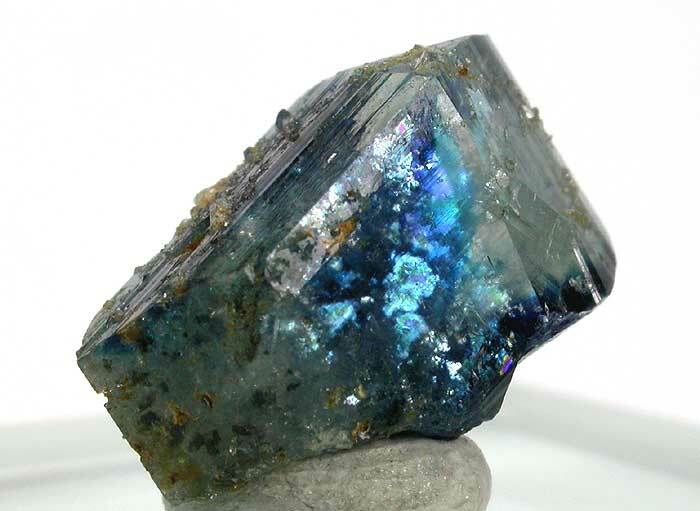 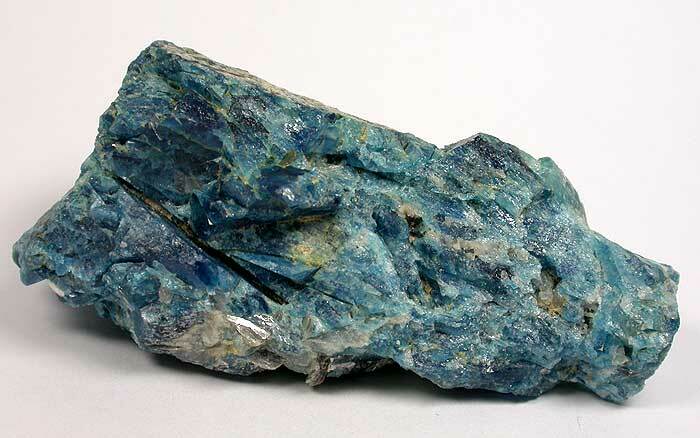 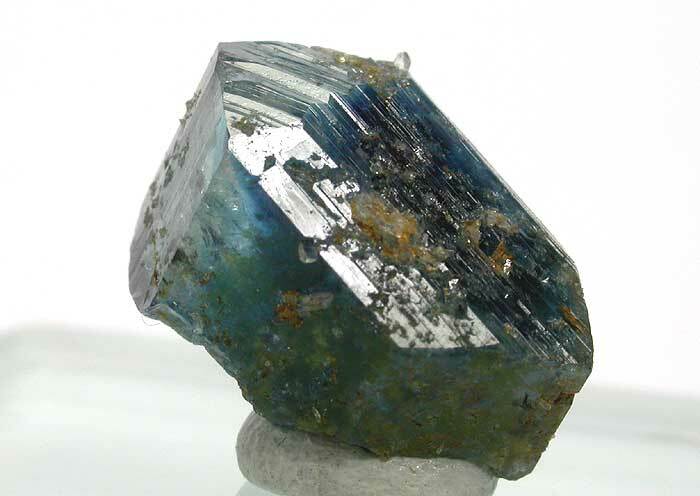 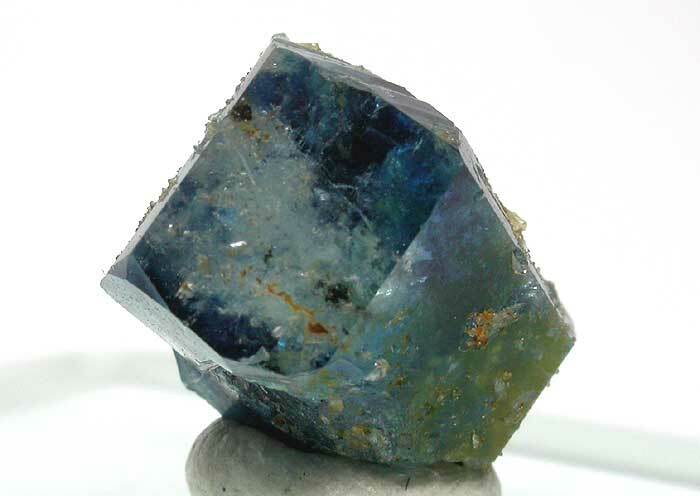 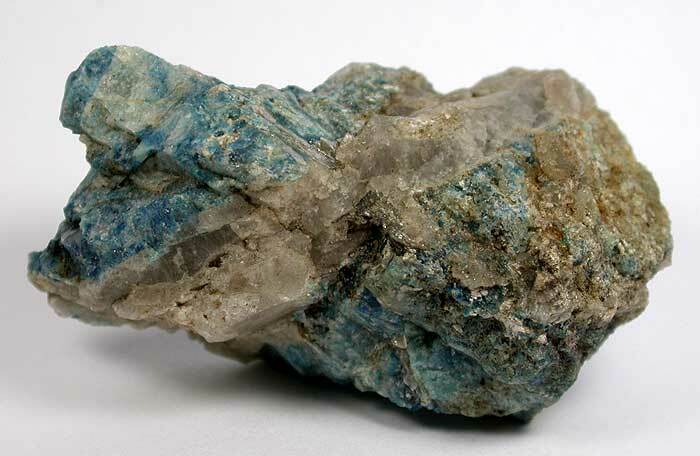 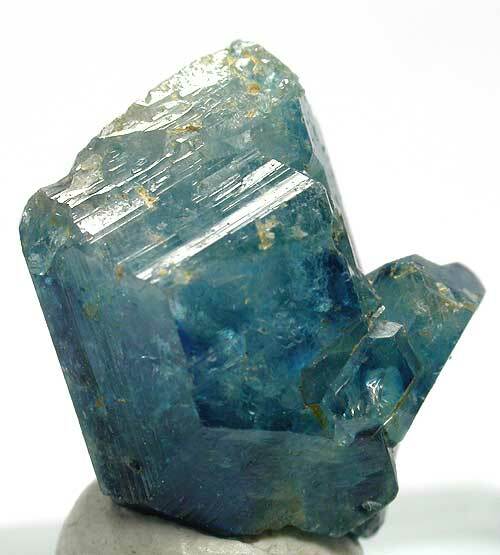 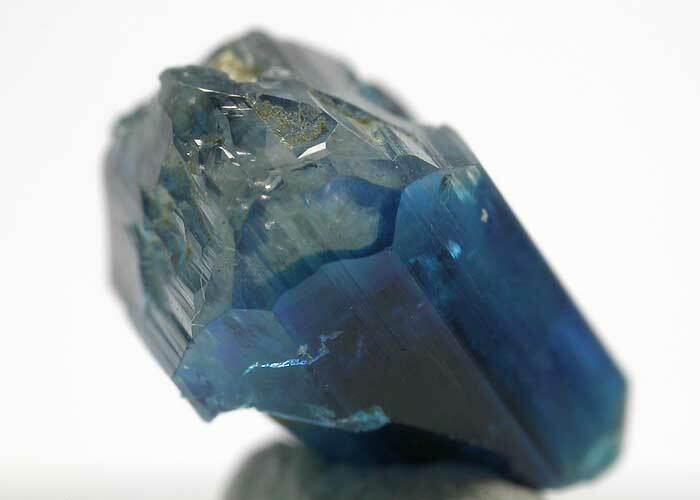 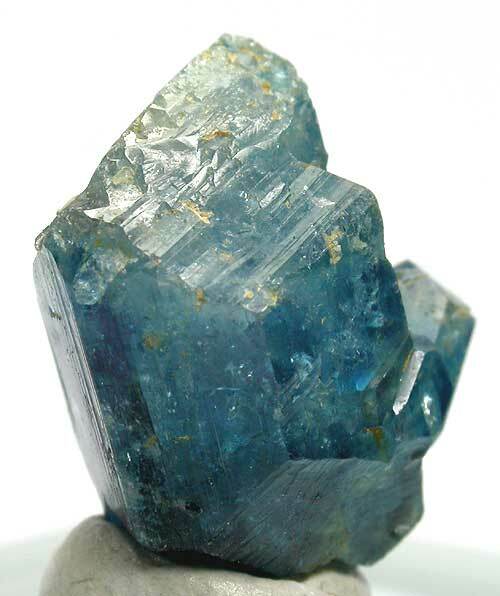 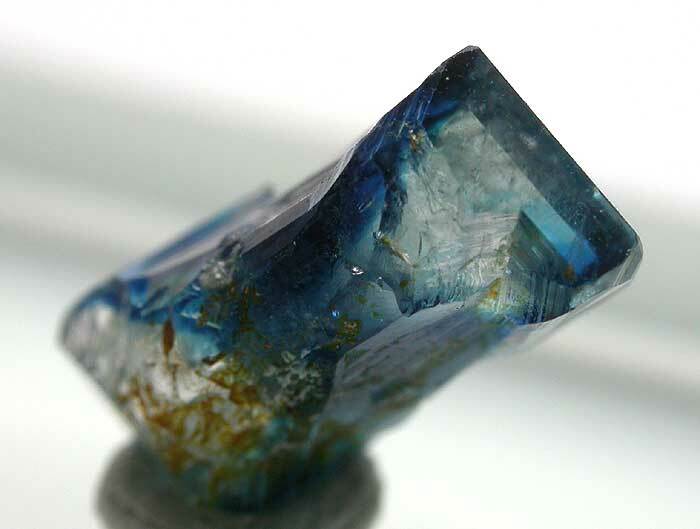 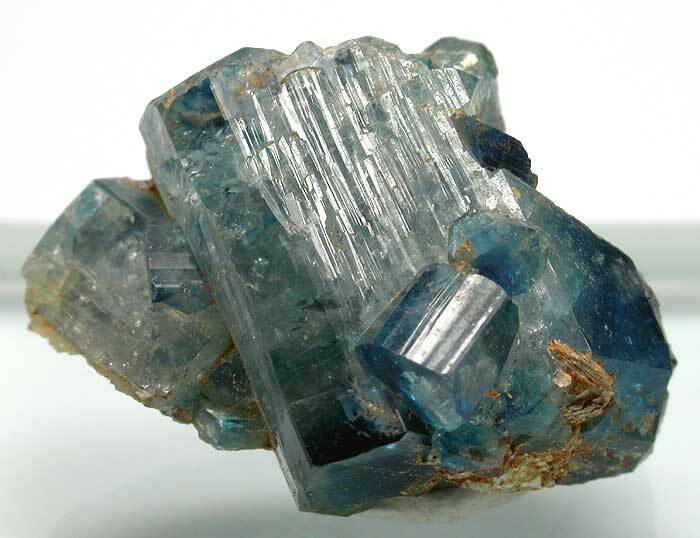 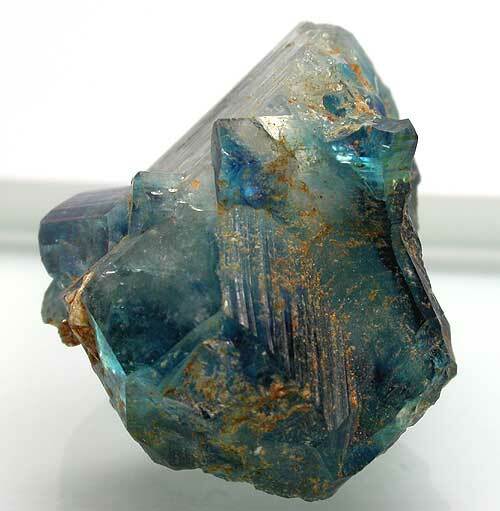 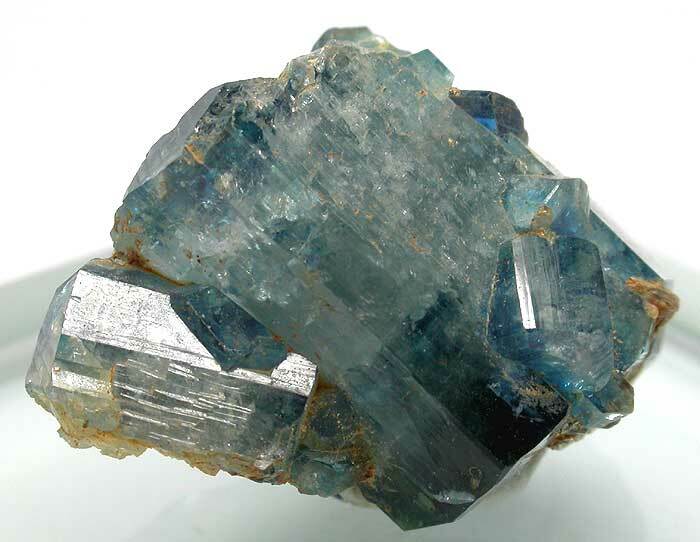 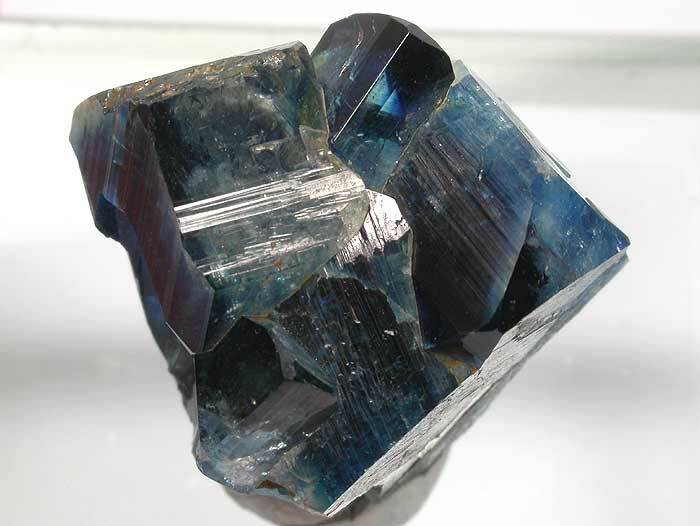 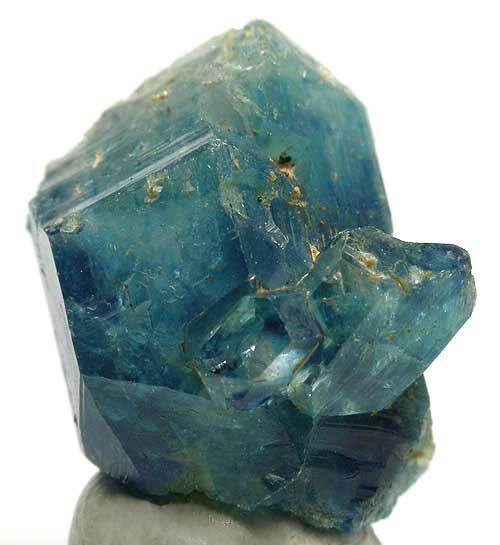 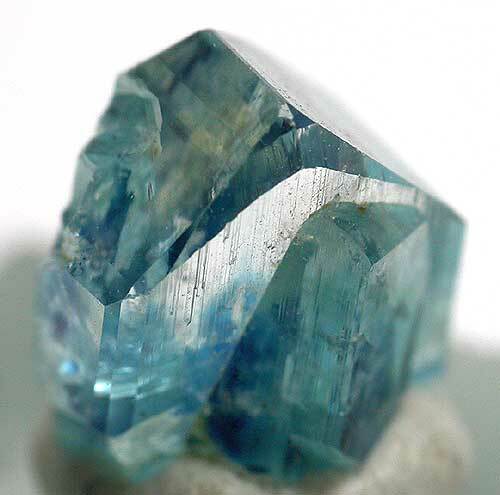 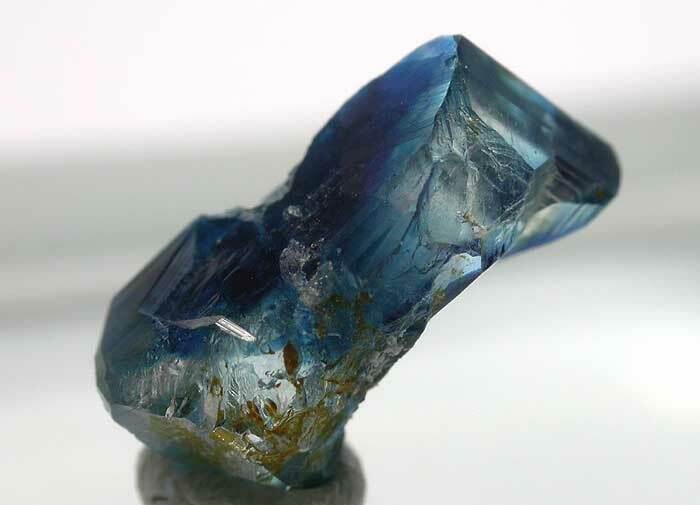 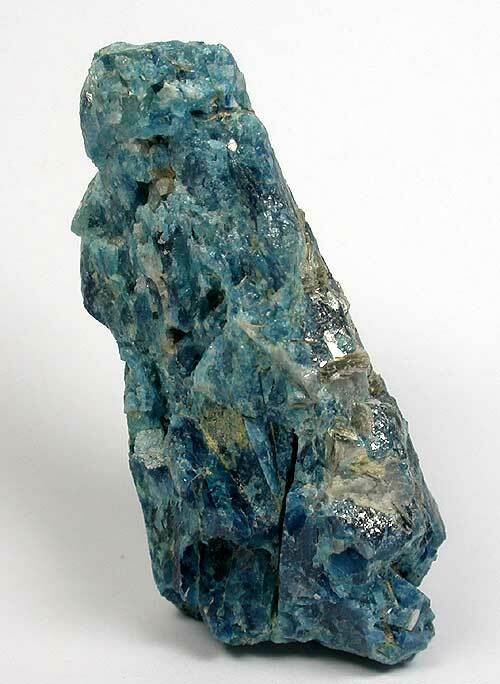 Description A rare, single, almost complete crystal of blue Euclase with an attachment point at the base and a smaller one to one side. 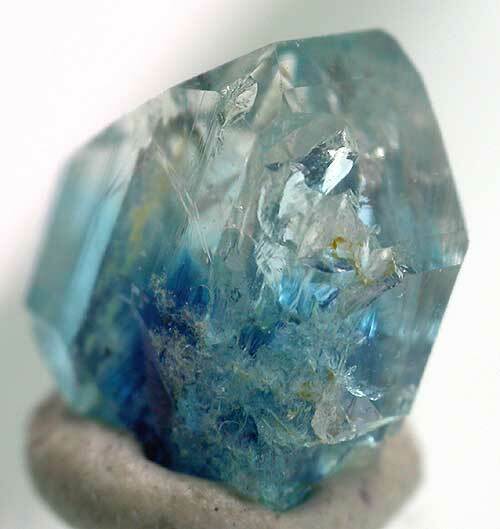 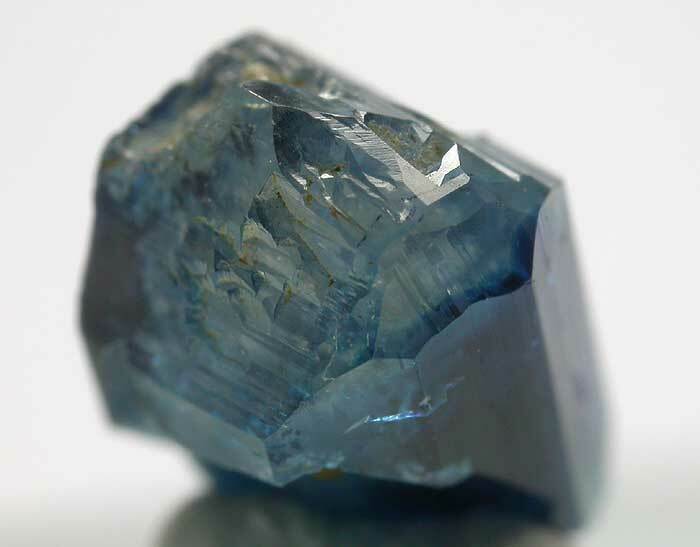 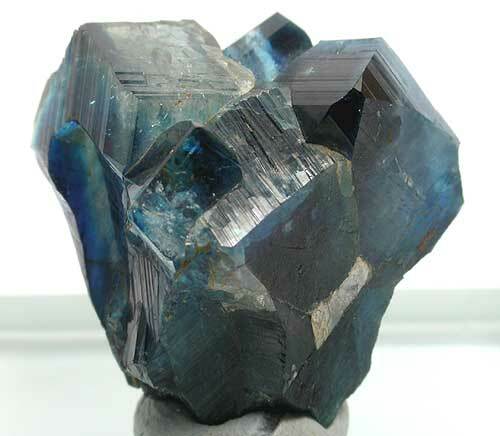 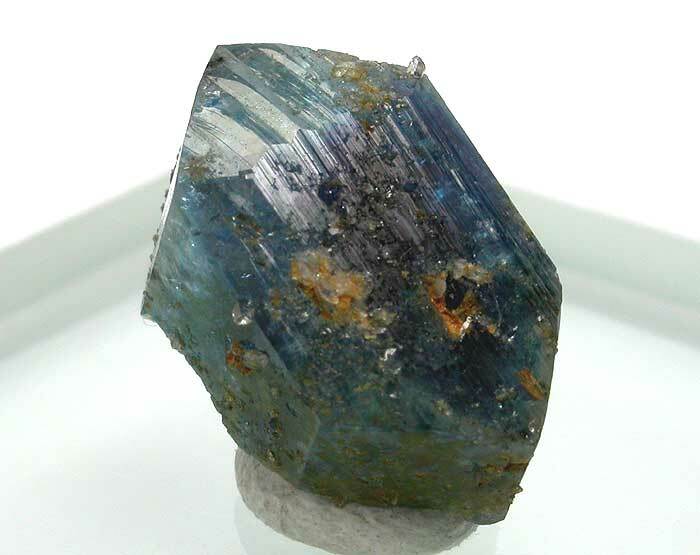 The crystal has deep ink-blue colour at it's core and a colourless tip showing in part the unique "hour-glass" colour zoning characteristic (but not common) of specimens from this location. 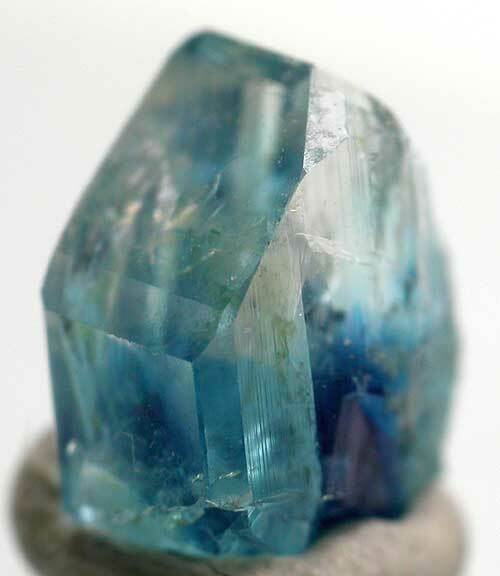 A particularly fine crystallised example of a rare gem mineral. 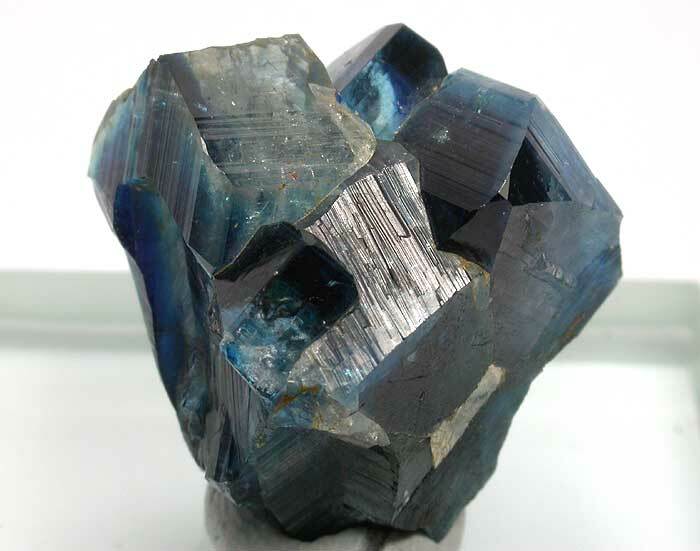 Description A superb small cluster of gemmy deep ink blue Euclase crystals showing partial colour zoning and good high lustre on a number of the crystal faces. 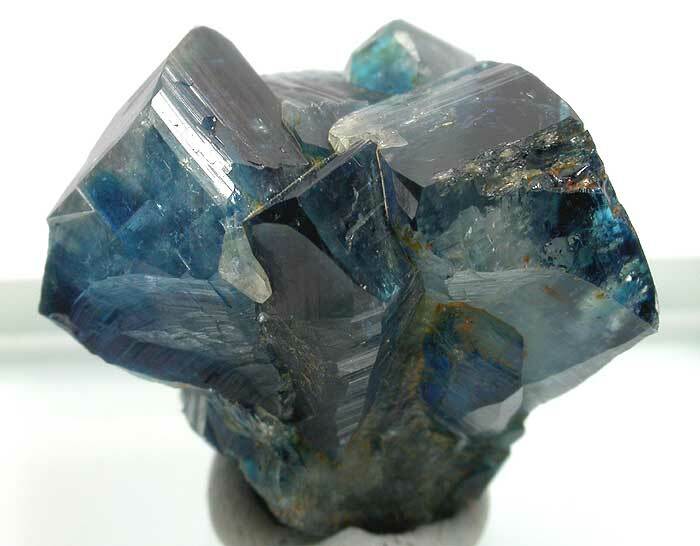 It is difficult to obtain crystal groups of this quality these days. 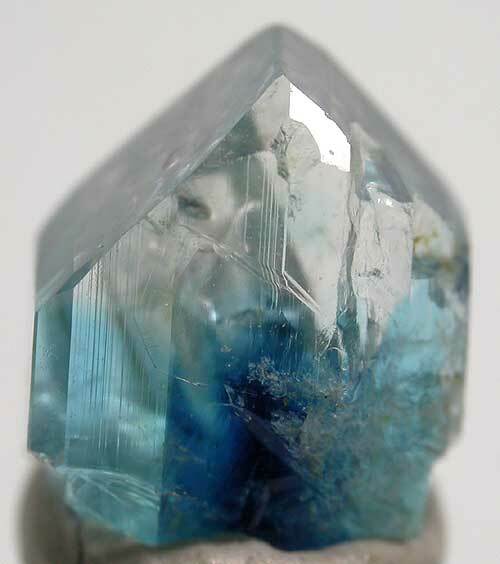 A fine example from this classic location. 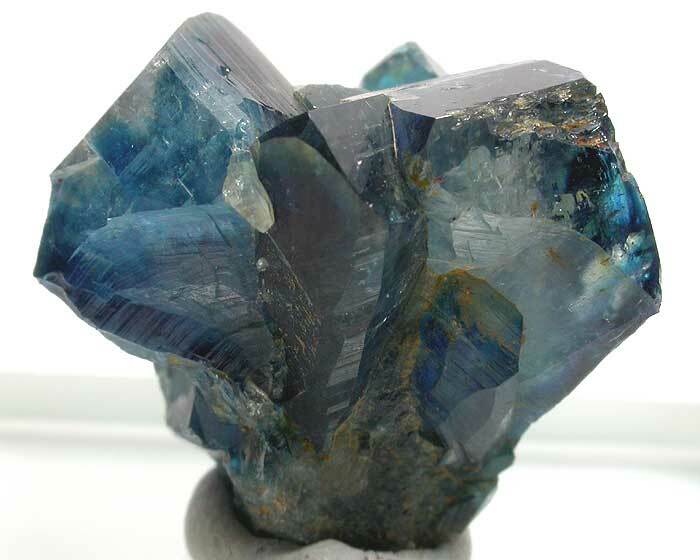 Description A superb small cluster of gemmy deep ink blue to paler blue Euclase crystals showing partial colour zoning and good high lustre on a number of the crystal faces. 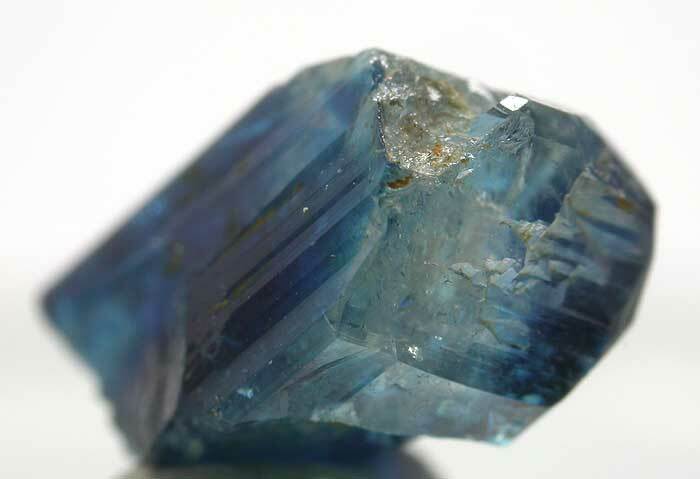 It is difficult to obtain crystal groups of this quality these days. 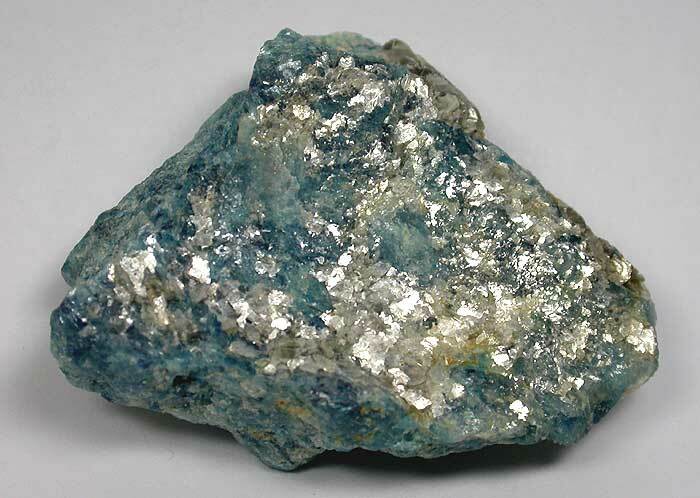 Alittle muscovite mica in association. 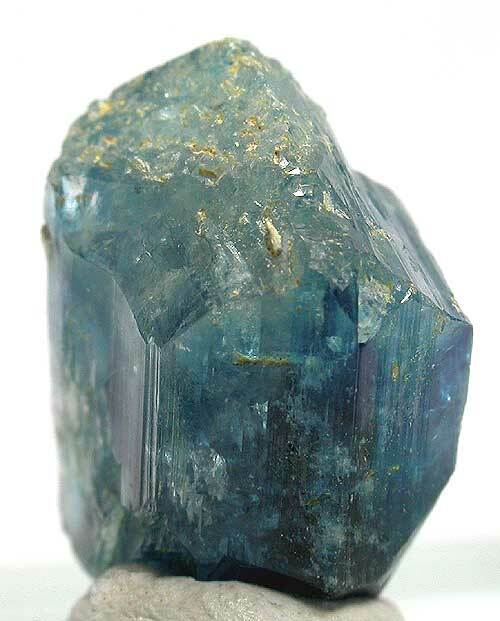 A fine example from this classic location. 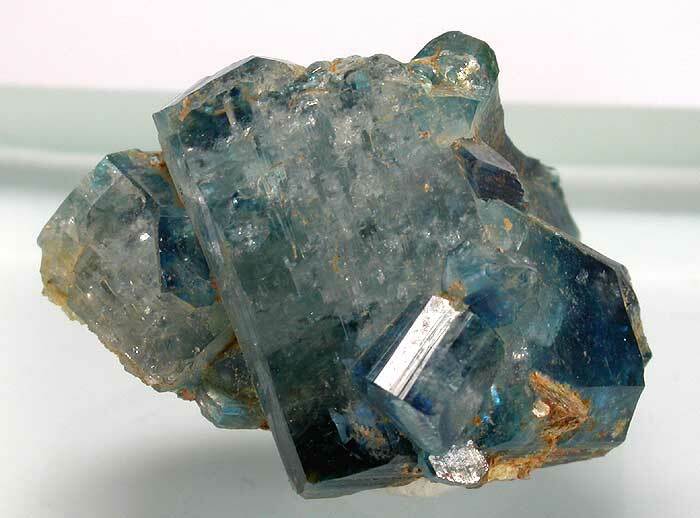 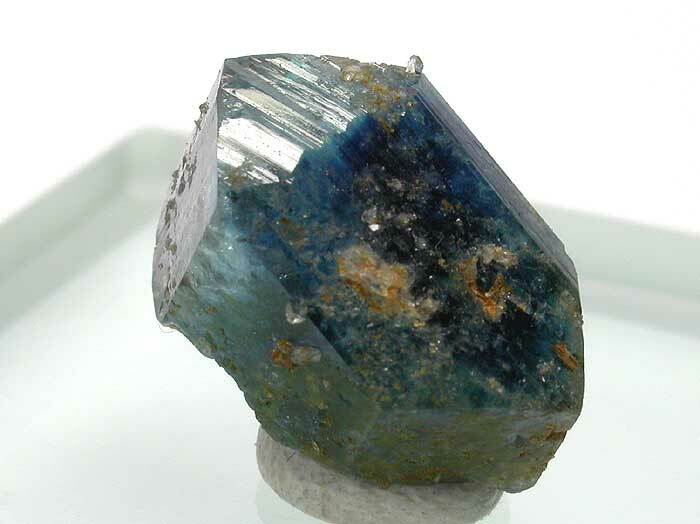 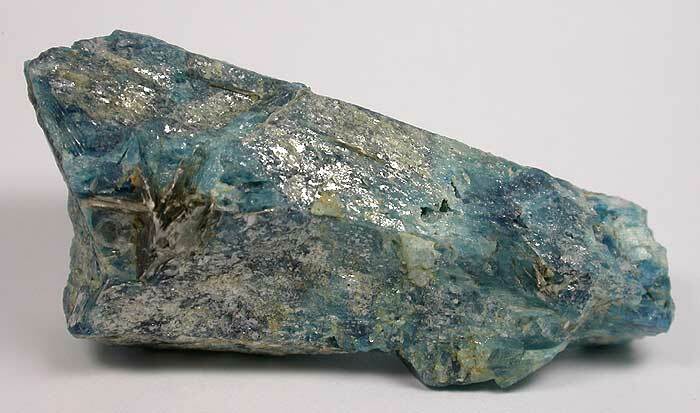 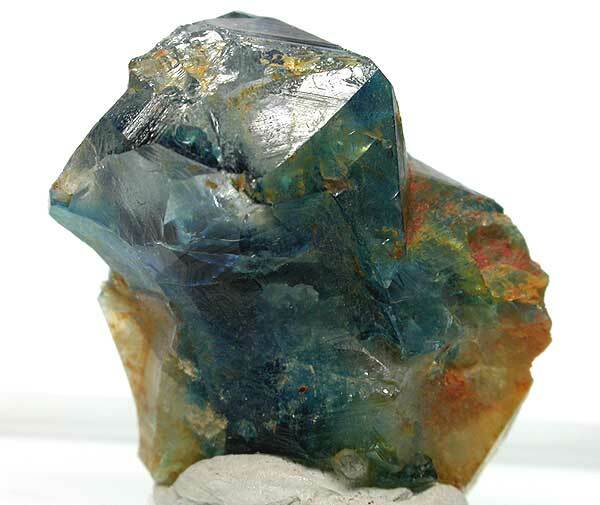 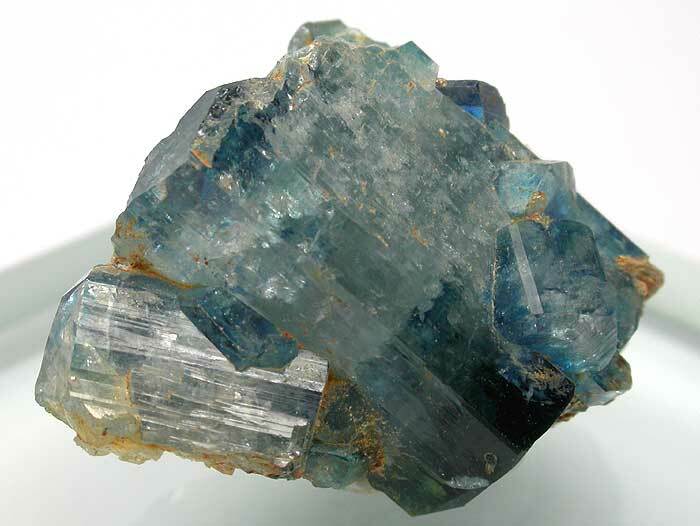 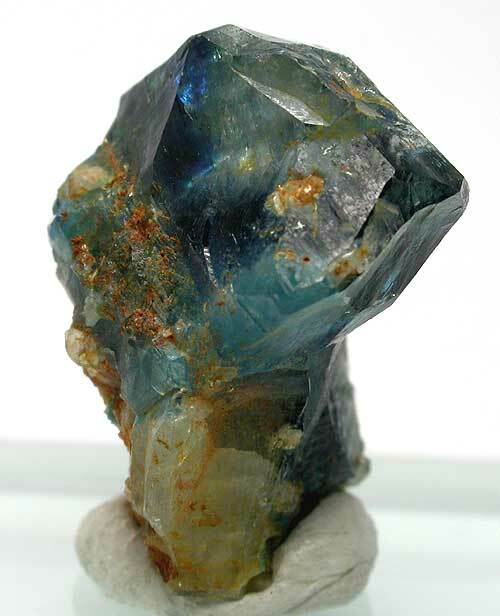 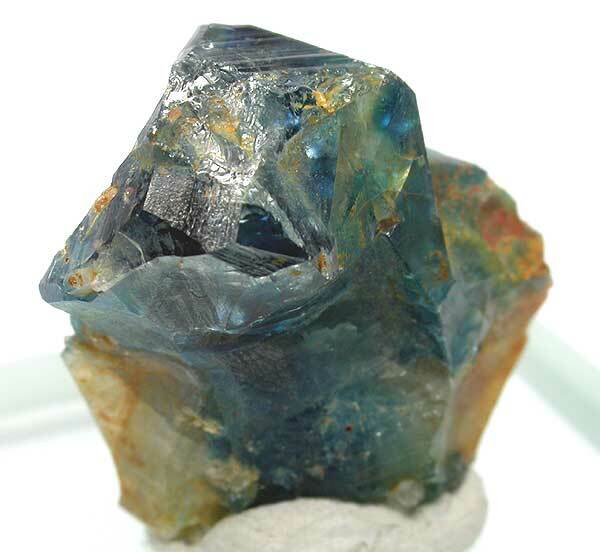 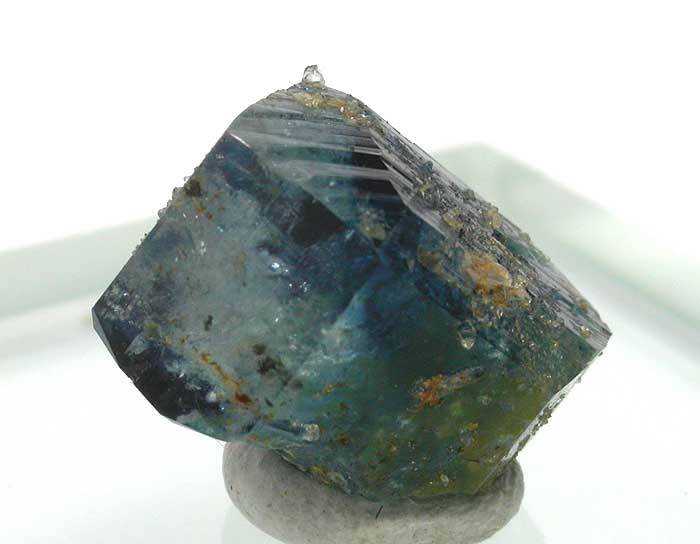 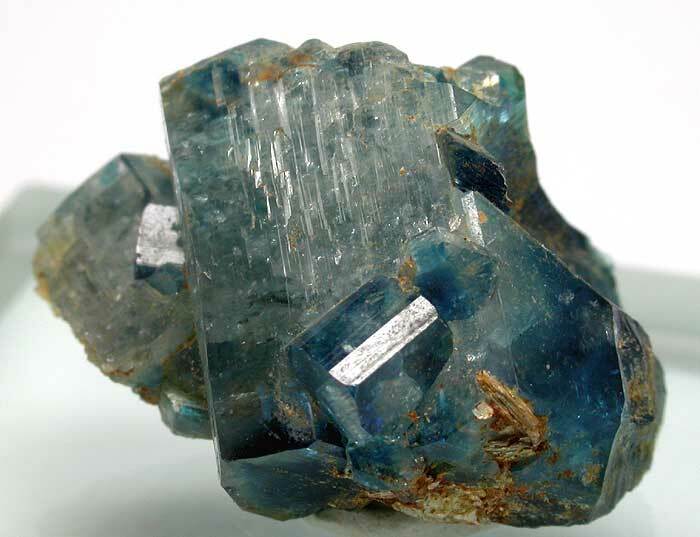 Translucent blue to colourless crystal section showing a number of contact points but still with a partially gemmy area. 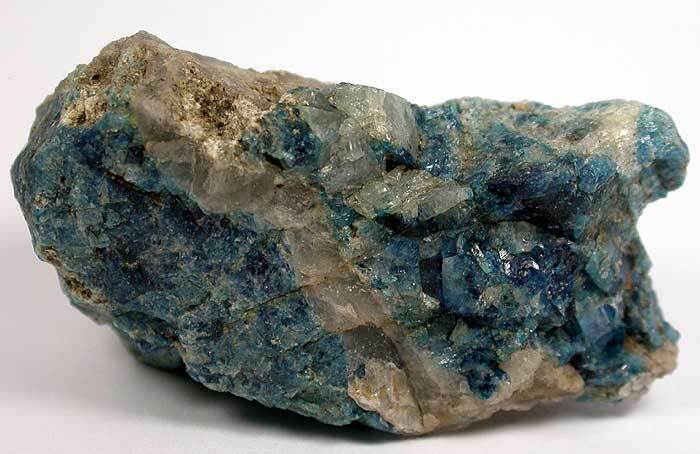 Nice representative example from thhe location. 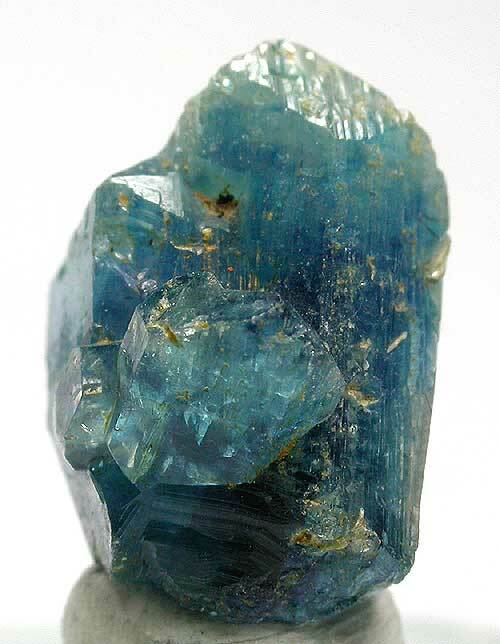 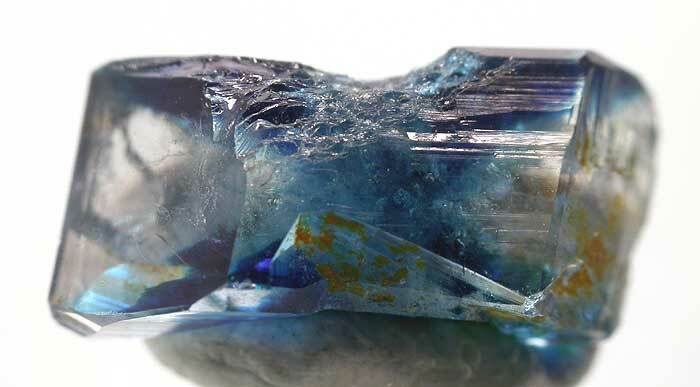 A 14mm, rich blue terminated translucent crystal of blue Euclase with another smaller crystal attached to one side. 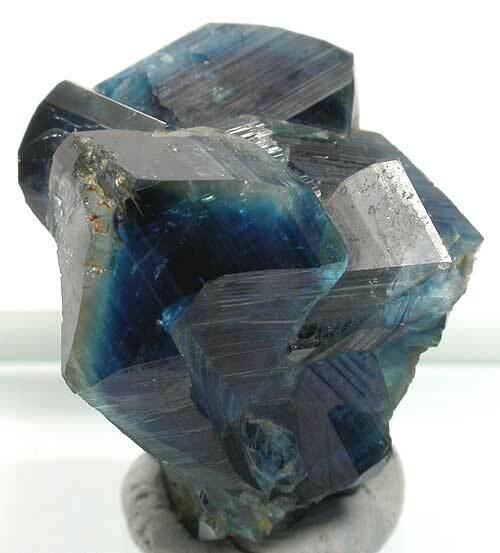 A fine example from this classic location. 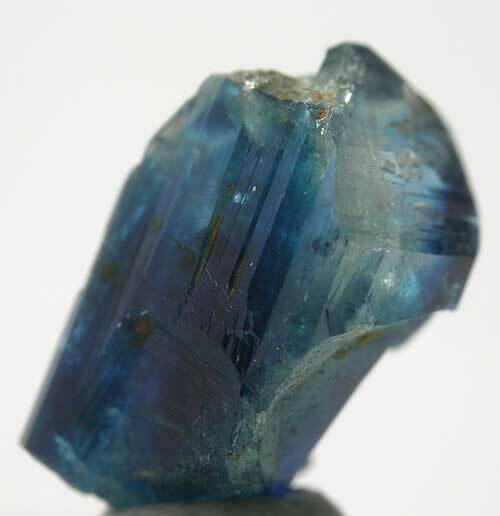 A superb 10mm gemmy deep ink-blue to colourless Euclase crystal showing the rare but typical for the locality "hour-glass" colour zoning and good high lustre and transparency. 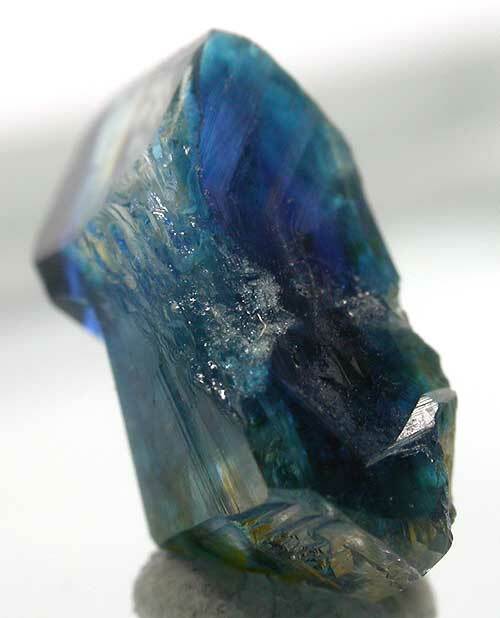 The specimen has one or two contact points and some minor damage but the remarkable colour zoning is unusual. 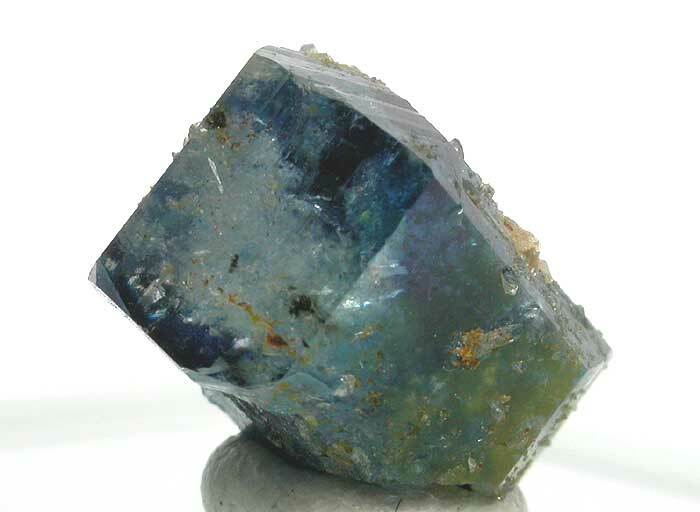 A fine and rare example for the gem collector. 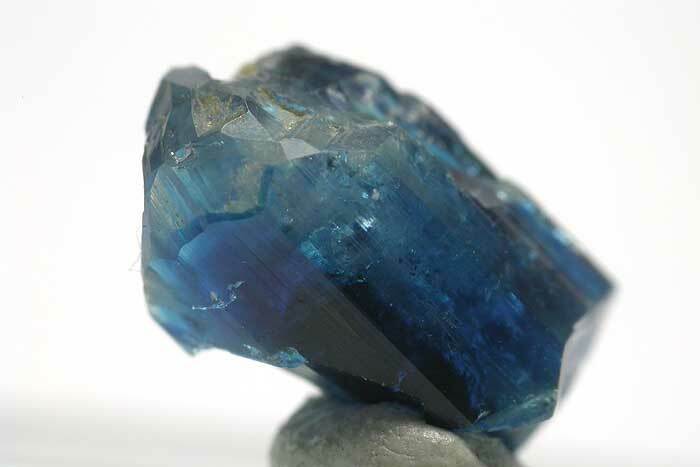 Description A superb small crystal of gemmy deep ink blue Euclase showing good colour and high lustre. 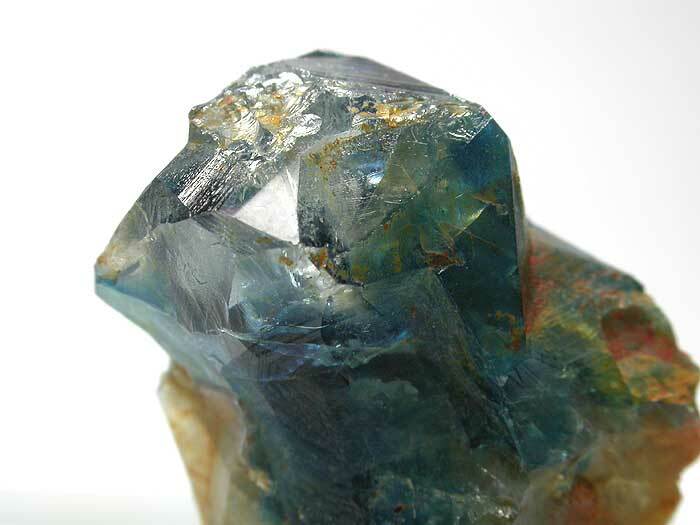 Minor points of contact here and there. 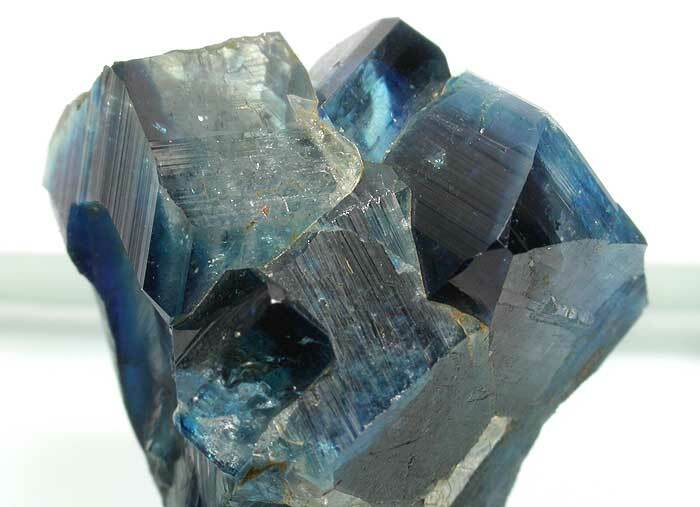 A fine example for this classic location. 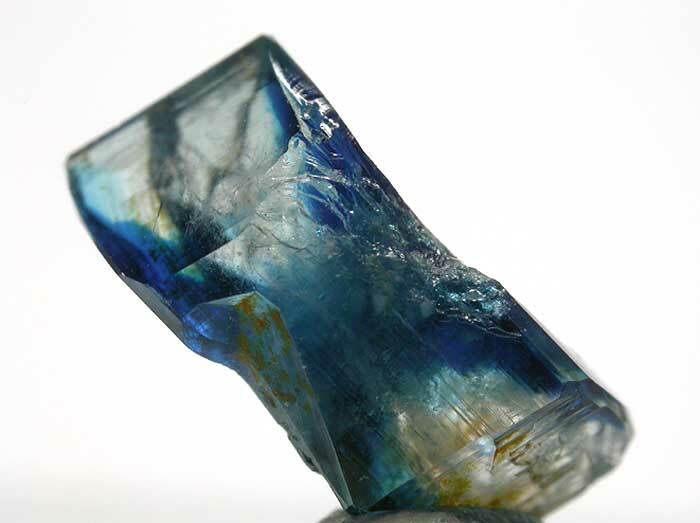 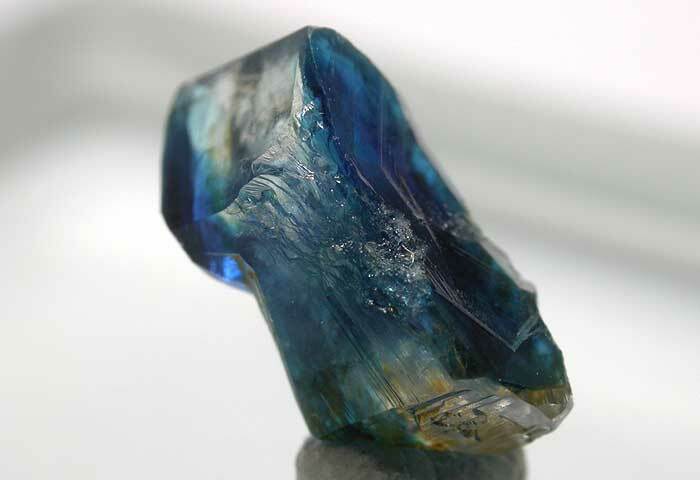 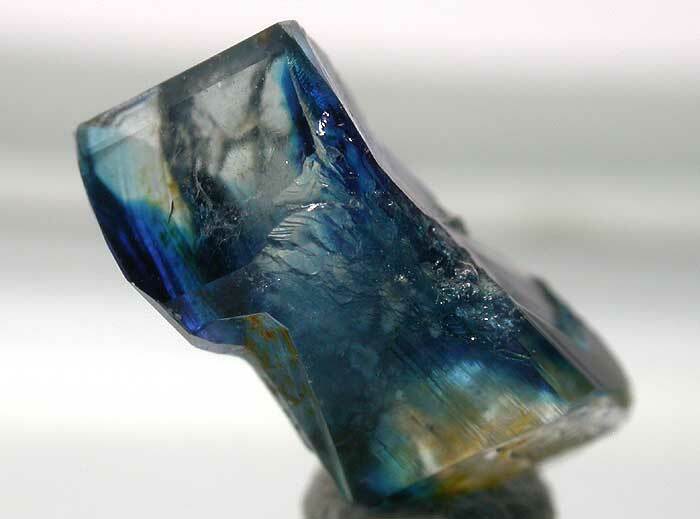 Description A small single gemmy deep ink-blue to colourless at the tip, terminated, transparent crystal of Euclase, showing colour zoning and good high lustre.